We have excellent links with 5 partner secondary schools who support our primary competition calendar by providing facilities, staff support and student leaders. This support enables us to run the largest primary competition calendar in Birmingham due to the fact we are able to run competitions at different venues during the same week. We truly value the support and commitment of our secondary partners so where possible we try and provide a variety of training and support for free in return. This is a two hour course (aimed at new sports leaders) covering the skills and qualities that it takes to become an effective leader. Students will cover several topics including organisation, teamwork and communication skills as well as developing their self-confidence through practical activities to help them lead small activities effectively. This is a one hour training session for all young leaders for a specific sporting event. The course will enable all leaders to assist in the running of Kingsbury SSP level 2 events or work with specific groups of pupils within their school. This is a one hour training session aimed at competent young leaders who want to work with less able pupils and those with Special Education Needs within their own schools or within the Kingsbury School Sport Partnership. Pupils will learn how to adapt and change activities to be stage appropriate and inclusive, ensuring all pupils can participate in sport. The Youth Sport Award is aimed at young people aged 10 – 24 years old. It allows young people to improve their leadership, communication and team work skills through volunteering their time to help at sports events, competitions and activities as well as committing to a healthy lifestyle themselves. The award builds self confidence, self efficacy and enhances well being. 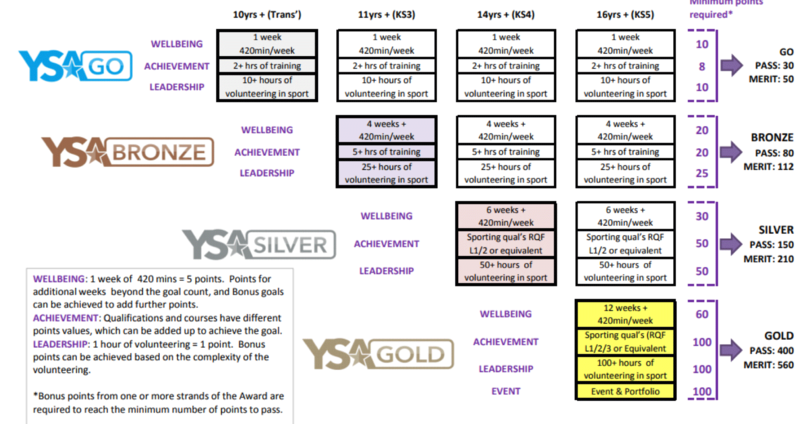 Young people will log their volunteering, exercise and training hours to achieve one of four awards; YSA Go, Bronze, Silver and Gold Awards depending on the hours they commit to. This course is ideal for anyone who has an interest in sports leadership and wants to have a healthy lifestyle.